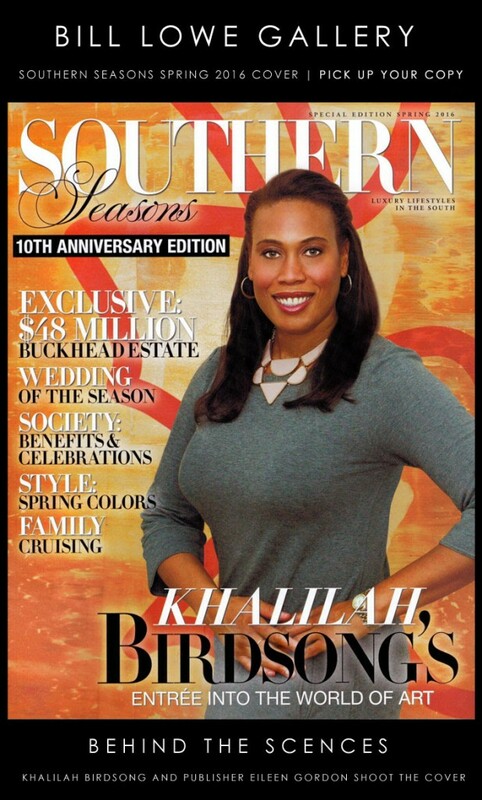 Today we’d like to introduce you to Khalilah Birdsong. I started painting six years ago in my apartment in East Atlanta, just as a way to relieve stress after work. I loved experimenting with different techniques, materials and large-scale formats. About a year into my hobby, I was painting seven-foot canvases in my apartment, and I by chance got noticed. I sold a few large pieces then the art scene started opening to me. 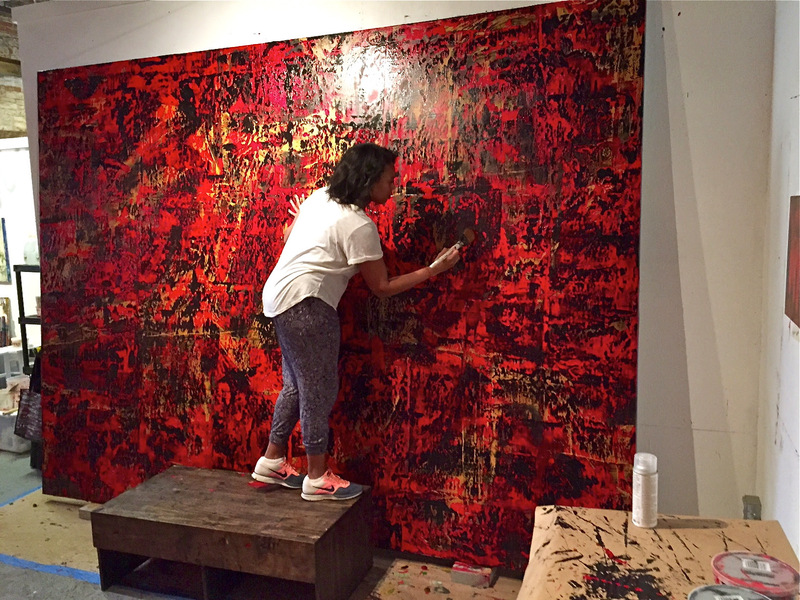 I moved into a studio where I began painting more seriously and I started exhibiting my work in galleries in Atlanta, painting commissions and Restoration Hardware Contemporary Art began selling my work around the country. I recently made the jump, left my day job and moved to Maui, Hawaii to focus solely on painting. Since then, the world of art has been opening it’s doors to me, while still exhibiting in galleries in Atlanta and Cincinnati, and painting commissions for clients and corporations on the mainland continental U.S. I recently exhibited in Tokyo, Japan and I’ll be exhibiting in Bologna, Italy in March 2019 and in a biennial in Florence, Italy in October 2019. I also have an exciting opportunity with an organization in London early 2019, which I’m not yet able to disclose. A certain amount of rejection comes with the territory. Put on your thick skin, keep working and continue applying. A certain amount of vulnerability comes with the territory. Putting your work out there for other people to see and judge is not easy. Keep your head up and put on a brave face. You can go hide after the opening! What should we know about your business? What do you guys do best? What sets you apart from the competition? I am a contemporary abstract painter. I primarily work on canvas but over the last few years, I’ve also been creating installation artwork. I am interested in survival and resurgence. Distress, weathering is palpable on the canvas, but so is resurgence. I build layers up and then take them away to create a painting that is, ultimately, whole. The process of layering and stripping builds contusions, bumps and raw ridges, but also reveals patches of older, more forgotten colors. The scale and evidence of physicality of my paintings echo Alfred Leslie, Joan Mitchell, Jean Riopelle and the late abstract paintings of Gerhard Richter. My work differs from many of these early abstract painters in that while many of those artists were tied to references to nature, and a looser freer gesture, this speaks to my own personal gestalt, rather than any movement or school of painting defined by social milieu or a specific time. I’m proud to have paintings acquired by the City of Atlanta that hang in the new Martin Luther King, Jr. Aquatic Center, and also to have work in President Barack Obama’s private collection, which is being considered for his Presidential Library. Be courageous and take risks. Go left when everyone else is going right. Be patient, believe in yourself and don’t be afraid to be hidden in the background for a time until it’s your turn to shine. During those quiet moments when no one is looking is when you can be focused on listening within and honing your craft. There’s no easier way to incorporate a bold hue into your space than with art. Here are seven to consider. Fine lines, contrasting colors and the perception of movement are captured in Khalilah Birdsong’s colorful abstract paintings. As a visual artist, Birdsong bases her studio in the lively and luscious foliage of Maui, Hawaii. 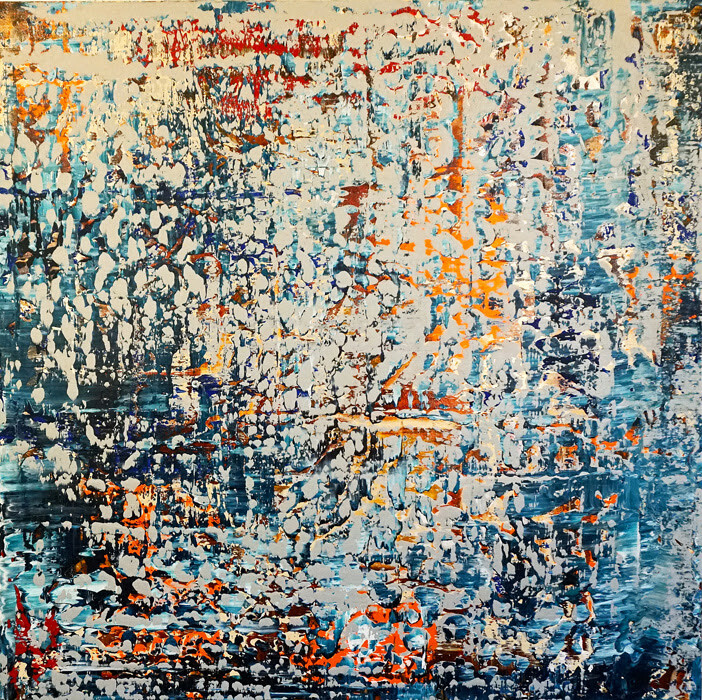 The artist uses polychromatic themes to serve as a base for her work before she layers different tints to create artfully uneven saturations filled with textures that allude to corrosion. 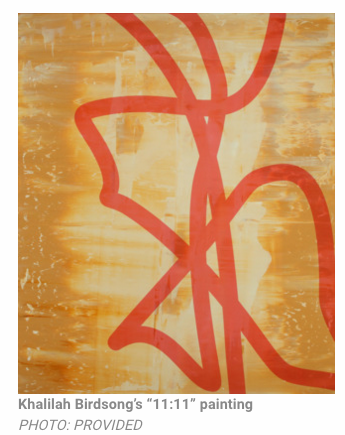 Birdsong’s work is a combination of exact physicality and balance, which she attributes to her own personal form. 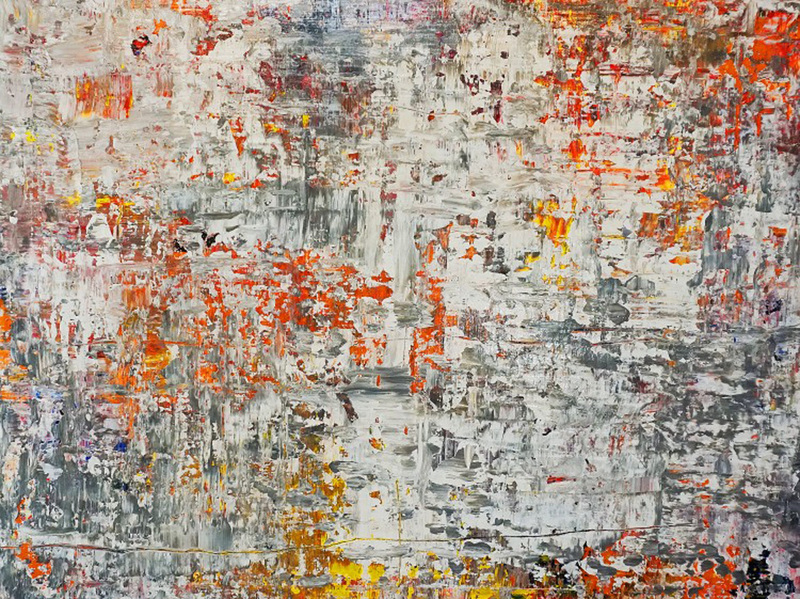 Her work parallels celebrated artists like Alfred Leslie, Joan Mitchell, Jean-Paul Riopelle and the late abstract paintings of artist Gerhard Richter. 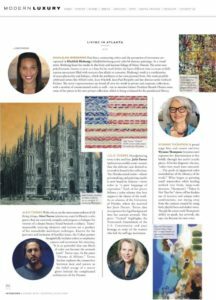 The artist’s representations are found all over the world in private and corporate collections, with a number of commissioned works as well—not to mention former President Barack Obama owns some of her pieces in his own private collection, which is being evaluated for his presidential library. Birdsong standing with a work in 2015. Birdsong, who was born in Ohio but grew up in Atlanta, is a self-taught painter who turned to artwork to work out the stress and anxiety of her life. 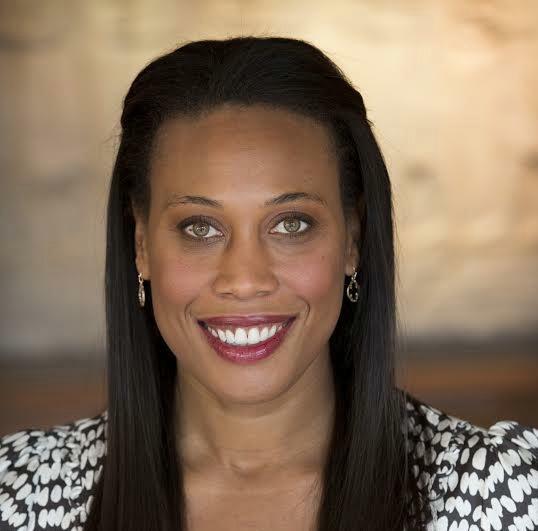 Through her work as director of communications at Tyler Perry Studios, most of her energies had gone toward fostering the visions and messages of other artists, creatives and executives. As a woman who has always taken her own intuition very seriously, she found herself drawn to painting as a means of self-expression just five years ago. Her ascent in the art world since her first trip to Michael’s is nothing short of impressive. 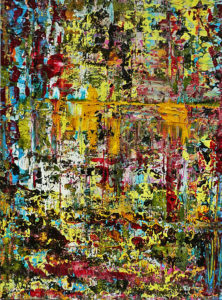 She was first represented by Bill Lowe Gallery before being picked up by Restoration Hardware Contemporary Art. 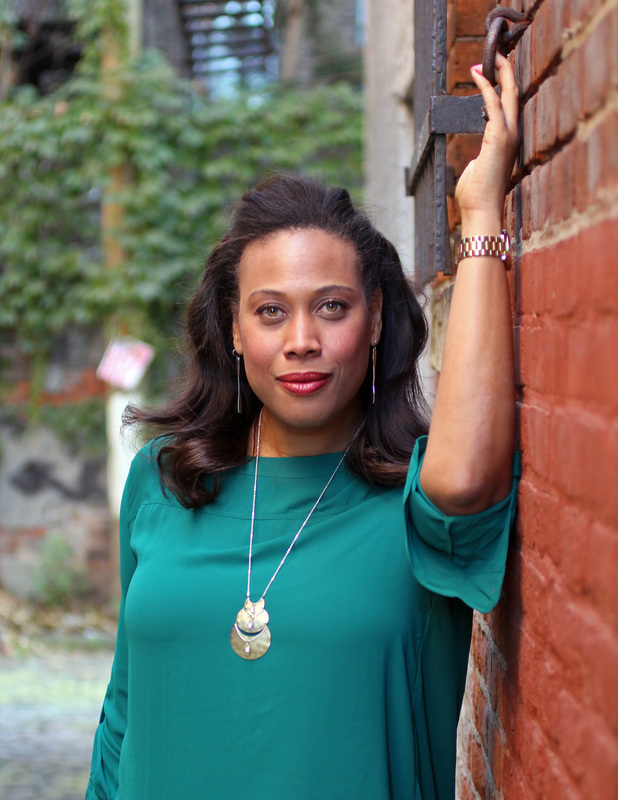 She’s been included in numerous group shows, had a solo exhibition at Cincinnati Art Underground last year and has works in the private collections of President Barack and First Lady Michelle Obama, Monica Kaufman Pearson and Tyler Perry, to name a few. Her works have also been on prominent display on shows featured on OWN: The Oprah Winfrey Network. Here, the works are seen on a beach in Maui. In her artist statement, Birdsong states that her works are explorations in survival and resurgence. “Distress and weathering is palpable on the canvas, but so is reawakening. I build layers up and then take them away to create a painting that is, ultimately, whole,” she says. The exhibition will include large expressionist works and more recent installation pieces. “I was really inspired by Daniel Arsham’s exhibit at the High Museum,” said Birdsong. “Art shouldn’t just be hung on walls.” She reflects on how her works from her solo exhibition in Cincinnati came back wrapped in kraft paper, which Birdsong didn’t want to waste. Her creative process led to dying canvases, utilizing the paper and wrapping up the works with rope. “They looked like gifts to me,” she remarked. Coincidentally, when Birdsong made her way to Maui to look for her new home (the artist now primarily lives in Hawaii, coming back to work with Tyler Perry Studios at least once a month), she opened up Hawaii Airlines magazine, only to see pūʻolo, a traditional Hawaiian offering. “It was so strange, I had no idea what a pūʻolo was when I made ‘Autumn’s Harvest,’” she said, “but when I saw them in the magazine I realized I had intuited exactly that, a traditional Hawaiian offering.” Birdsong felt that it was an auspicious sign for her impending move. It may have also been propitious for Birdsong’s artistic practice. In addition to her exhibition at Hathaway, the artist has had two works acquired by the City of Atlanta for the new Martin Luther King, Jr. Natatorium Center. She’ll also be in conversation this Sunday at Art Over Dinner at Serenbe. I’m a large scale abstract contemporary artist and I paint very expressive colorful pieces. I chose that particular medium because I learned early on that I had a lot to express without being tied to line or form. I think having access to public art really does improve the lives of everyday Atlantans. It inspires you. I can see other people being pulled in by it. And for a brief moment, it transports you from your everyday thoughts and concerns and provides a means of escape. 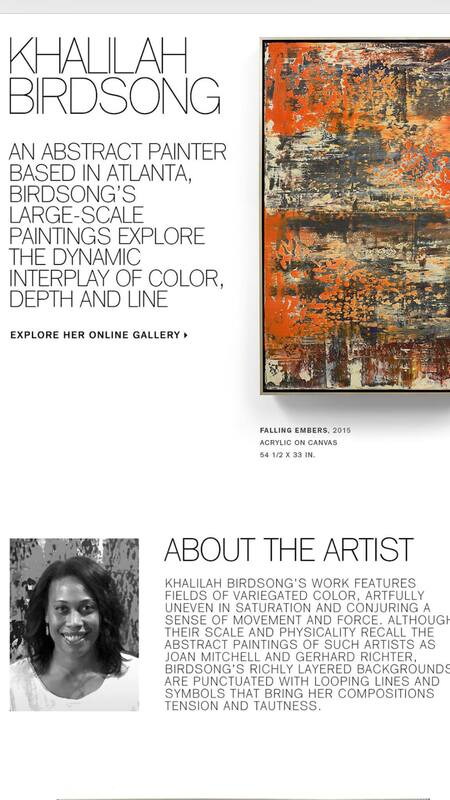 Atlanta artist Khalilah Birdsong talks about art in Atlanta. 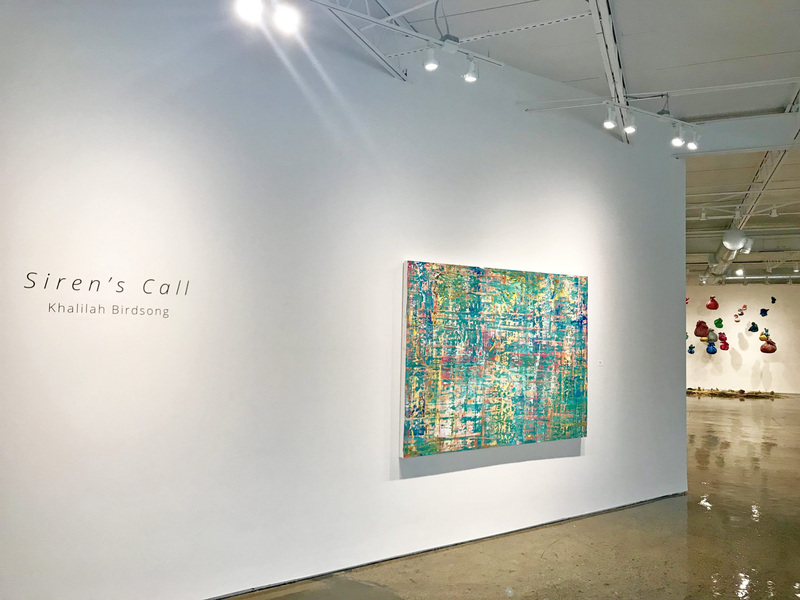 A new ‘Underground’ gallery in OTR Cincinnati Art Underground is currently exhibiting Khalilah Birdsong’s ‘Amalgamation,’ featuring work reminiscent of the paintings of Gerhard Richter. 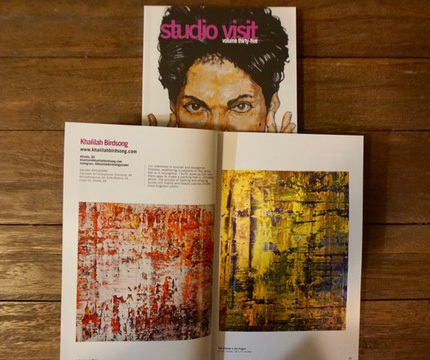 I had heard of Cincinnati Art Underground, an Over-the-Rhine commercial gallery that opened in late 2015, but not yet visited it when I received a press release in November announcing the current show, Khalilah Birdsong’s Amalgamation. 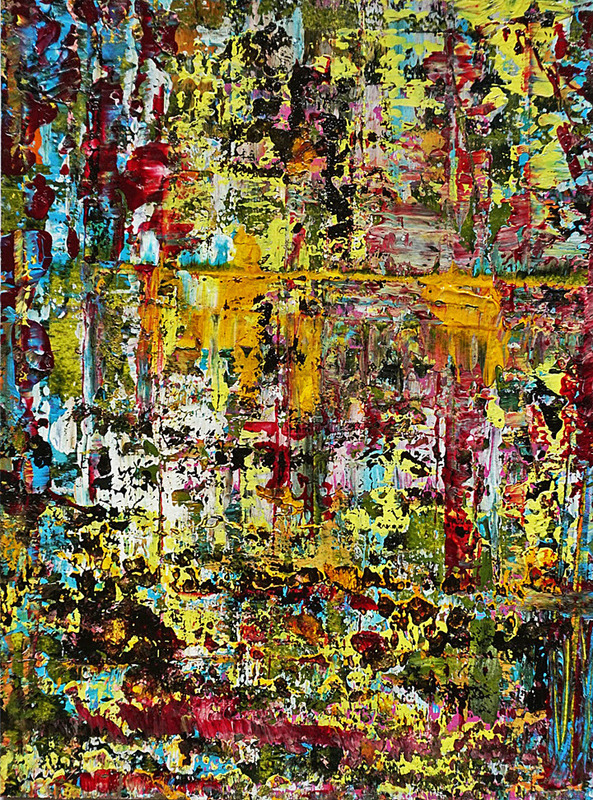 It impressed and surprised me because it came with a photo of a colorfully abstract painting that had a striking similarity to the work of Gerhard Richter. It had that look of paint engagingly applied, perhaps rolled, onto canvas and then carefully scraped to achieve a sense of movement, of action, to make it seem alive. ws sophisticated taste. But it also could be called “derivative,” not a word that the Contemporary art world likes to use, although artists are naturally influenced by others. Having now attended the show, which is on display through Jan. 21 at the gallery at 1415 Main St., I can see that. I can also see beyond that — this is a commercial Contemporary gallery trying to make an impact by offering coherent, focused shows by artists local and national. As the gallery owner Rachael Moore, who is working with artist/creative director Andrey Kozakov on programming Cincinnati Art Underground, explains in an interview, she wants this to be a place that presents shows in a serious way. That means they have a limited number of artists — even just one — and also firm opening and closing dates. The work is presented like a cultural event, not as inventory in a showroom. Birdsong has strong ideas that come through in her work. 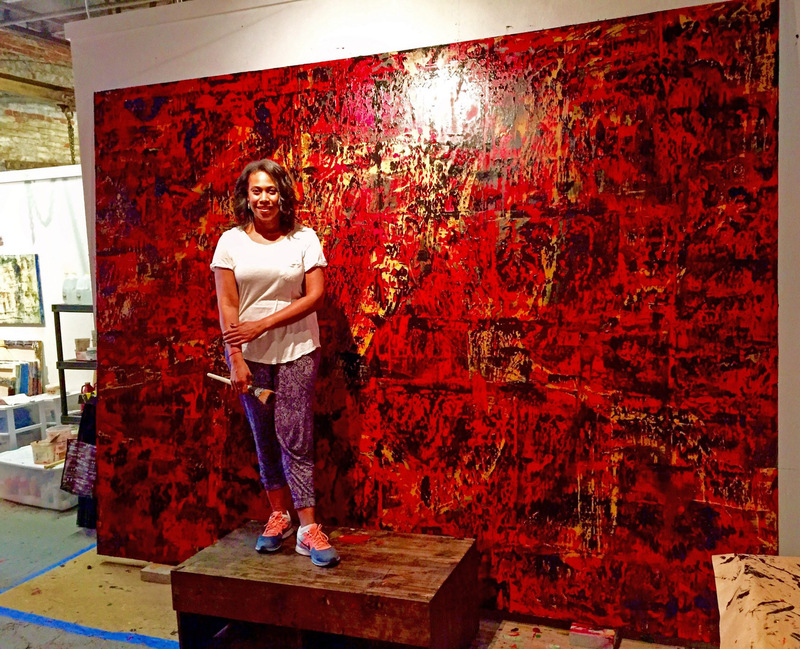 A resident of Atlanta who took up painting as a diversion from her job as an executive with Tyler Perry’s film and television business, she has deep talent. 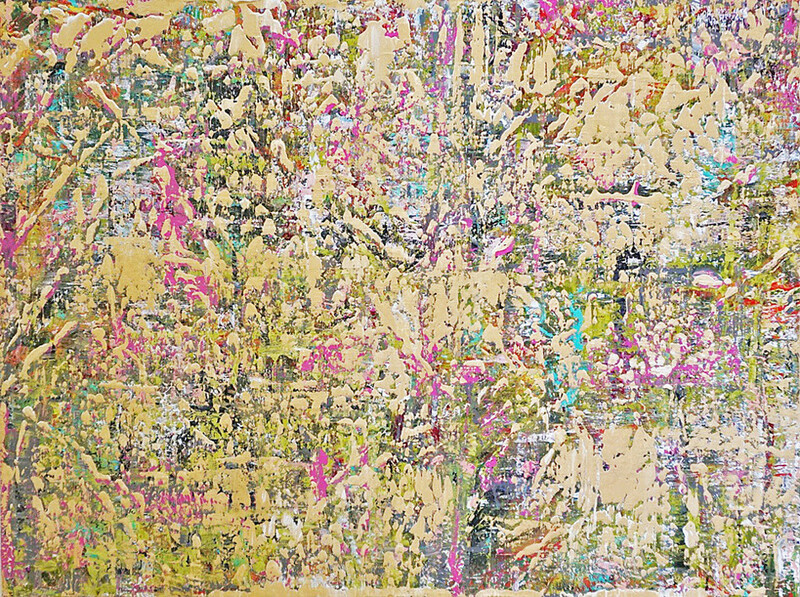 In the painting “Frayed Edges,” Birdsong has applied remnants of old scripts and call sheets, used in her entertainment industry job, to her canvas. It’s novel. There is the issue of whether Cincinnati has the collectors to support the artists Moore wants to show. But she is continuing onward with her dedication to her approach. Opening Jan. 27 and continuing through Feb. 4 is an exhibit of paintings by David Gerena, who established himself in 1980s-era New York as a street artist. The opening will feature a DJ. 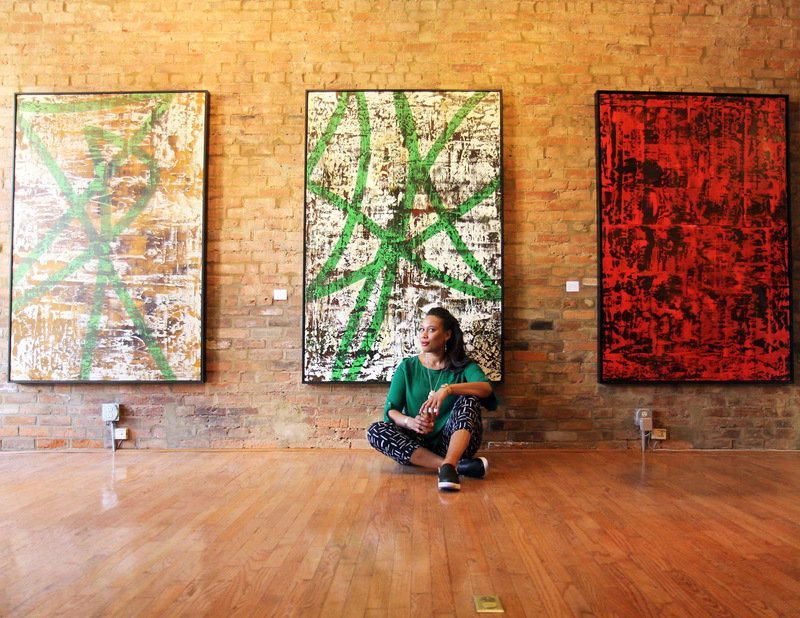 Practiced at managing the creative talents of others, abstract painter Khalilah Birdsong’s career in business has been defined by the intentionality and pragmatism that often comes with that path. 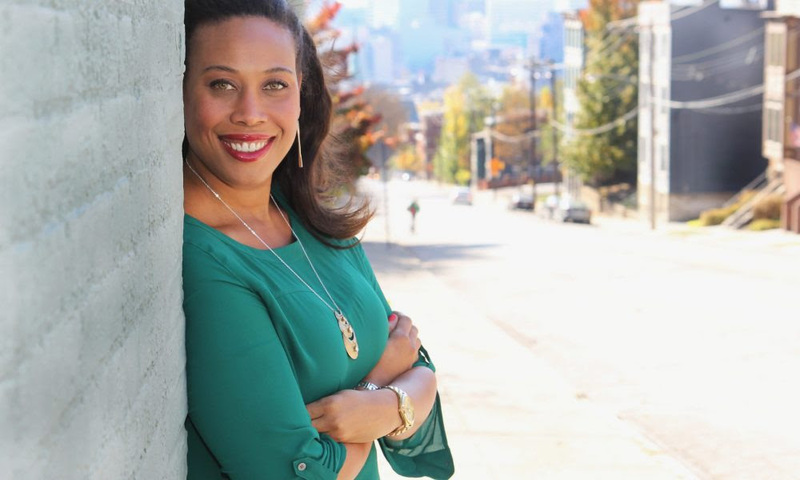 She finds herself in a proverbial pool of creativity in her current role as Director of Communications and Engagement for Tyler Perry Studios where she has held various positions for the last eight years. Even with her practical mind juxtaposed to this hub of creation, Khalilah had never seriously explored an artistic medium. But just four short years ago, guided by impulse or intuition, Khalilah left the office and found herself in the paint aisle at Michaels®, the art supply and hobby store. With the difference between oil and acrylic paint lost on her, she chose a wooden bird as her first canvas. “I remember the first stroke across the bird’s wing: August 4th, 2012. I was hooked, transcended,” Khalilah told me. After the bird came small canvases, which eventually yielded to dimensions of seven to ten feet. She laughs and tells me that the six-foot canvases surrounding us are babies. “I’ve always wanted to paint big. I guess I’ve always had a lot to say; my soul had a lot to get out,” she said. An endeavor that began as a data dump thrust her into the discovery of the depths of her own creativity, rather than that of others. Khalilah’s studio is based at The Goat Farm Arts Center in Atlanta where she grew up, but she was born in Ohio and tells me that being here feels like coming home. We met at Cincinnati Art Underground where her exhibition, Amalgamation, is on display. The collection of abstract paintings is striking in both scale and saturation, but the physicality of her work offers another dimension for those who seek out her work in person. There’s intentionality to the layering and stripping away of paint, almost reflective of her pragmatic mind, which creates texture while revealing glimpses of “older, more forgotten colors.” There’s a viscerality balanced within the stratum that keeps your eyes from resting for too long. Because of this spatial relationship, the viewer’s physical presence adds another layer to her work. While interpretation of any work can be influenced by light, hers can transform with a particular angle. If you look closely enough, between these layers you’ll find anything from pages of scripts to chunks of charcoal. She follows this layering process and as the materials shift, so do the outcomes. These densely layered pieces are a stage or a layer in their own right within her creative process when viewed alongside other works that embody earlier phases of creation, all holding relationship with one another. Each piece holds its own place in time, its own place in her process of growth. With every added layer and with every layer your mind strips away, the piece takes new form. The spatial relationship transcends to a temporal level for Khalilah. “This amalgamation of time represented is the unification of both materials and the different spaces you find yourself in while creating,” she said. This amalgamation—this process of combining or uniting—can only be experienced in person. 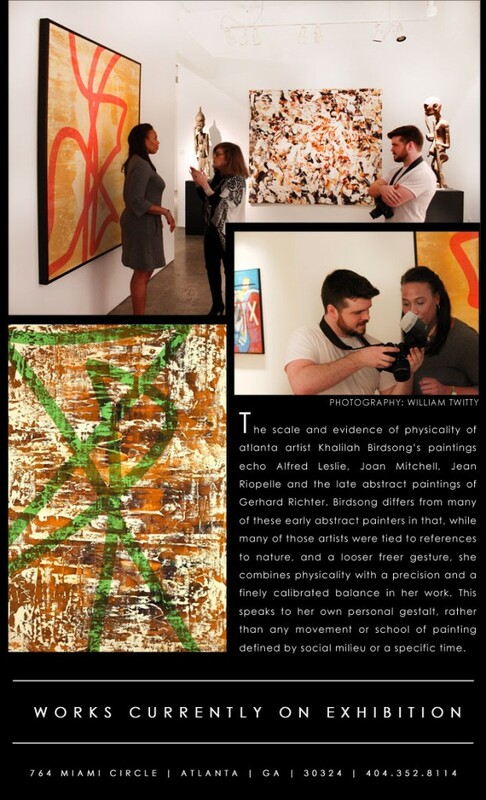 In just four short years, Khalilah’s paintings have taken their places among major national galleries including Bill Lowe Gallery in Atlanta; on the set of Tyler Perry’s drama “If Loving You Is Wrong;” on OWN: The Oprah Winfrey Network; and in the personal collection of Barack and Michelle Obama. Additionally, Khalilah works with RH Contemporary Art (Restoration Hardware) and Loupe Art on Apple TV. You can experience Amalgamation at Cincinnati Art Underground, 1415 Main Street. The exhibition will show through January 21, 2017. Also, find her work at www.khalilahbirdsong.com. Copyright © 2015-2019 Khalilah Birdsong. Duplication of this site or its work, in part or whole, without express permission by the artist is restricted by law.